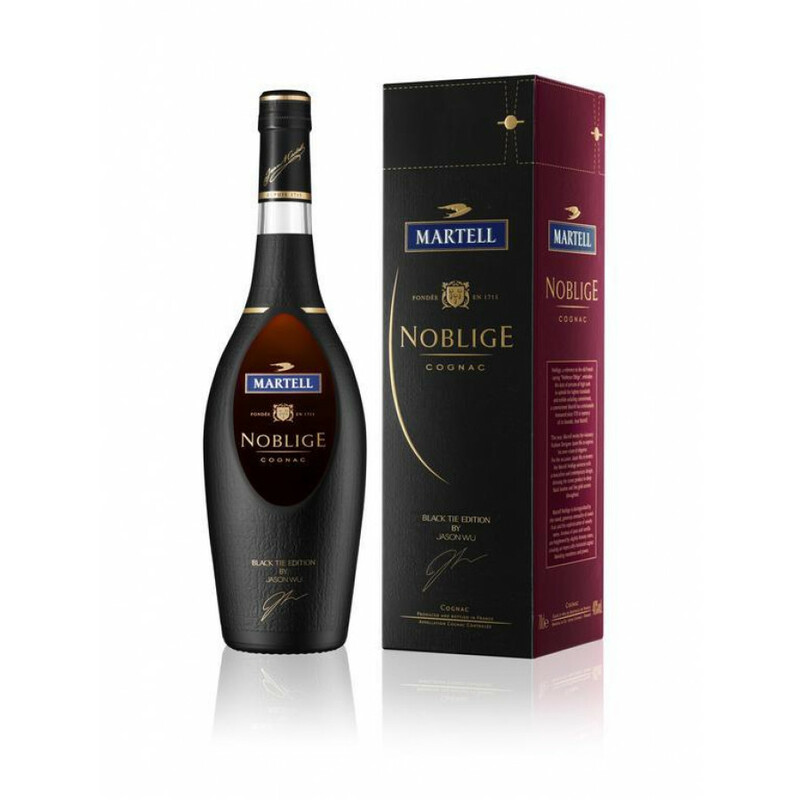 The content seems to be the same as the original Noblige: Its color is dark copper, on the nose some fresh and fruity notes, slight hints of dry fruits and oak. Taste: Floral aromas, some vanilla and nuts. Borderies eaux-de-vie cru. The aftertaste is smooth and long at the same time. A delight to enjoy straight, warmed gently in your hand. The Martell Noblige By Jason Wu Cognac is a special edition of Martell's Noblige edition. Martell Noblige Napoleon is a reference when it comes to the upper premium VSOP / Napoleon cognac. This 70cl bottle reveals a great blend, aged in oak barrels. The black Cognac bottle itself is elegant and contemporary. Infused with timeless codes of masculine style and elegance, Jason Wu has brought his own perspective to reinvent the Martell Noblige. Leather-like effects in deep black with touches of gold, inspired by the dinner jacket, extend an invitation to enter a sophisticated world in which conviviality and elegance are paramount. Martell Noblige and Jason Wu share common values based on that genuine elegance which comes from inner resources and is in no way superficial. “Elegance is much more an innate sensibility, something that comes from the inside” commented the charismatic artist. With his sober and sensitive style, he crafted the bottle and presentation box with the greatest attention to detail, while suggesting inner elegance – perfectly matching the cognac contained inside.